From the Archive: One year ago, 20 first-graders went off to school in Newtown, Connecticut, some surely thinking about the upcoming Christmas holidays. But they never came home, becoming along with six of their educators collateral damage in the NRA’s big-dollar war to boost gun sales, as Beverly Bandler noted last March. The issue of the NRA vs. America is not only about the nation’s horrific gun violence epidemic. Americans have to decide whether the National Rifle Association and the gun industry should continue to corrupt our political system, whether the NRA with an estimated 3 million members and a management dominated by firearms manufacturers should control politicians and determine public policy for 315 million. The NRA has morphed from a group that represented ordinary gun owners into a front group for the firearms industry, whose profits are increasingly dependent on the sale of military-bred weapons like assault rifles. Today’s NRA also stands astride some of the ugliest currents in our politics, combining the “Astroturf” activism of the Tea Party, the unlimited and undisclosed “dark money” of groups like Crossroads GPS, and the sham legislating of groups like the American Legislative Council. Wayne LaPierre, the NRA’s executive vice president, is in the business of selling the American public a “Hellish World” in order to frighten them into buying into the idea that their survival requires them to buy more guns, join the NRA and organize opposition to gun control measures. The NRA has been called a “cynical, mercenary political cult” by a former employee. 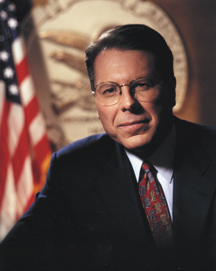 However, in December 2012, after 20 first-graders in Newtown, Connecticut, were murdered by a gunman wielding a semi-automatic assault rifle, LaPierre said, “The only thing that stops a bad guy with a gun is a good guy with a gun.” He proposed that armed, NRA-trained vigilantes patrol each of the nation’s nearly 100,000 public schools, discarding the gun-free zones he once championed. But the NRA is not only out of touch with mainstream America’s desire for common-sense gun laws; it is also out of touch with its own members. NRA members are much more sensible about gun safety than the management of the non-democratic, top-down, hierarchical NRA. A May 2012 poll revealed moderation: three out of four NRA members believed that background checks should be completed before every gun purchase. Nearly two-thirds supported a requirement that gun owners alert police when their firearms are lost or stolen. But the gap between the public’s desire for gun sanity and the NRA’s insistence on gun madness is best explained by following the money. NRA’s corporate patrons include 22 firearms manufacturers, 12 of which are makers of assault weapons with household names like Beretta and Ruger. Donors from the industry and other dark reaches of the corporate world have funneled some $52 million to the NRA in recent years. LaPierre serves at the pleasure of a 76-member board that is stocked with industry brass, and which is all but self-perpetuating. Only one-third of the board’s membership is up for re-election in any given year. Voting is limited to the NRA’s honored “lifetime” members and to dues-payers with at least five consecutive years of being in good standing. One of the NRA’s 10-member nominating committee is the CEO of Freedom Group which manufactures the Bushmaster semiautomatic that Adam Lanza used to slaughter the 20 children and six teachers in Newtown. The NRA’s political contributions totaled $2,850,033 between 2003 and 2012, 74 percent of which went to Republicans, according to Follow the Money.org. In the 2012 political races, the total percentage of contributions that went to the GOP: 88 percent. The consequences of the NRA’s long-running assault on gun-safety laws have been devastating to American citizens. “Since 1968, more Americans have died from gunfire than died in all the wars of the nation’s history: 1.2 million died in wars (from the Revolutionary War though the Iraq War); 1.4 million died in firearm deaths,” according to Politifact. Author Tom Diaz has written that “In the four decades between 1969 and 2009, a total of 5,586 people were killed in terrorist attacks against the United States or its interests. By comparison, more than 30,000 people were killed by guns in the United States every single year between 1986 and 2010, with the exception of the four years in which the number of deaths fell slightly below 30,000,1999, 2000, 2001, and 2004. But this death toll is of little concern to the NRA. It uses inflamed rhetoric about protecting America’s “freedom” and “civil rights,” but its real purpose is the selling of more and more guns and the expansion of the corporate power of the multi-billion-dollar gun industry. “The NRA wins because Americans lose focus,” writes Tim Dickinson. So, the only way to counter the NRA’s power is for American citizens to stay focused, committed and consistent, and to understand that this issue is not only about gun violence. It is also part of the struggle between America and right-wing extremism. Beverly Bandler’s public affairs career spans some 40 years. Her credentials include serving as president of the state-level League of Women Voters of the Virgin Islands and extensive public education efforts in the Washington, D.C. area for 16 years. She writes from Mexico. Diaz, Tom. The Last Gun. The Last Gun: Changes in the Gun Industry Are Killing Americans and What It Will Take to Stop It. The New Press, (March 26, 2013). Feldman, Richard. Ricochet: Confessions of a Gun Lobbyist. John Wiley & Sons; 1 edition (October 26, 2007). Harkinson, Josh. “Does the NRA Really Have 4 Million Members?” MotherJones, 2013-01-14. Schecter, Cliff. “5 Issues That Divide Gun Owners and NRA Leadership.” The NRA’s membership agrees with most Americans that our gun laws should protect our families, not the financial interests of a clique of elites. Alternet, 2012-07-22. Sugarmann, John. National Rifle Association: Money, Firepower & Fear. CreateSpace Independent Publishing Platform (April 19, 2010). Wilkie, Christina. Wayne LaPierre: “More Guns Needed For ‘Hellish World’ Filled With Hurricanes, Kidnappers, Drug Gangs.” The Huffington Post, 2013-02-13. The majority of gunfire deaths included in the above statistic are: criminal acts with illegal guns (e.g. Gang Crimes), deaths of violent criminals shot in self defense, and the deaths of criminals shot by police officers in the commission of a crime. Less than .1% of the stated Americans in the above stats have died from gunfire by legal gun owners. The odds of becoming a gun death statistic are even less if the gun owner is an NRA member. The NRA provides education and training, not just political rhetoric. NRA gun owners and their children participate in additional education, and training, on the proper use, handling and storage of their firearm. This is especially true when it comes to their children. Would you ban all automobiles to eliminate automobile deaths? or maybe you would encourage better driver education, practice, and training. While you can argue that you want to disarm the public to make society safer, I suggest that you find a way to disarm the criminals first, and responsible educated NRA gun owners last. Since it is impossible for you to do the first, you cannot argue that a responsible citizen can not have the right to defend themselves. Oh yeah, you once wrote how “parsing lies is the craft of statehood”… I couldn’t agree more. You are a pretentious twit. Good article by Ms Bandler – – especially revealing are the statistics that support the above statement : â€œSince 1968, more Americans have died from gunfire than died in all the wars of the nationâ€™s history: 1.2 million died in wars (from the Revolutionary War though the Iraq War); 1.4 million died in firearm deaths,’ according to Politifact.” IF we lived in a semi-rational world, organizations like the NRA would be under scrutiny for CONTRIBUTING to domestic terrorism as a supplier of materiel – – – other groups are put on terrorist watch lists for a whole hell of a lot less (i.e. ; animal rights groups that let animals out of cages, eco-activist groups, etc). As usual, this liberal views the world standing on his head while insisting that the world is upside down. The private sector isn’t waging any “war” on America, the private sector IS America. It is government hacks and their financial and media enablers who are making war on our rights – the REAL “War on America”. As usual, conservative ideology trumps statistical facts.